In an effort to do its part to promote total body wellness, Core Greens, Grains & Bone Broth active lifestyle eatery is hosting a special fitness event next month. The community is invited to Core Greens, Grains & Bone Broth Yoga Feast, a day devoted to yoga and wellbeing, on Saturday, November 14 beginning at 10 am. The event takes place at Core Greens, Grains & Bone Broth and Chuck Hafner’s Greenhouse, both located at 7265 Buckley Road. Four local studios will be offering free yoga classes in a serene environment surrounded by poinsettias and twinkle lights. Beginners and advanced level students will find a class that suits their needs. O Yoga Studio will start the day by offering the first class at 10 am. Taught by Sophie Tashkovski, the Foundations Class is a Vinyasa Flow class focused on alignment, increasing strength and improving flexibility. It is an all levels class suitable for both the beginner and experienced yogi. Lotus Life Yoga Center’s Erin O’Toole will offer a Slow Flow Yoga class at 2 pm. This class is open to all skill levels and offers a blend of hard and soft postures, breath and mental focus and an opportunity recharge the body. At 3:30 pm, the Dharma Yoga Center will offer a Dharma I class appropriate for those moving up from beginner to intermediate. The class will include an introduction to yogic philosophy and flowing from one pose to the next. Kristen Griffin from Method 360 Fitness will wrap up the event with Yin Yoga at 5:30 pm. This class focuses on working the other half, the deeper “Yin” tissue of our ligaments, joints, deep facial networks and even our bones. Yin Yoga is open to everyone, even those who have never before studied yoga. All Yoga Feast classes are free, but advance registration is requested. Click here to make a reservation for your preferred class. Those participating are encouraged to bring their own yoga mat, towel and water. Core Greens, Grains & Bone Broth has previously offered special fitness events to the community, such as a yin/yang yoga class this past summer. 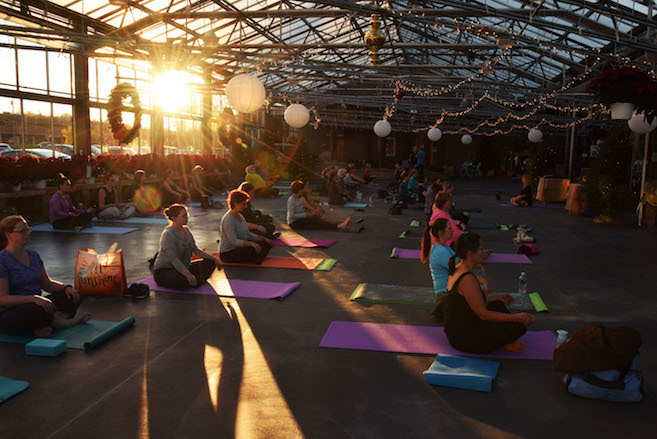 This single day event was one of the largest restaurant-based yoga events held in the Syracuse area. Since its opening in April, the new Core Greens, Grains & Bone Broth active lifestyle eatery has been serving delicious, healthy food featuring unprocessed ingredients that enable peak performance. The Core Greens, Grains & Bone Broth menu features hearty simple meals based on dark leafy greens, whole grains and slow-simmered bone broths. The customer can choose from a wide variety of seasonal vegetables, crunchy toppings and sustainably raised meats in the creation of each custom entrée. Core Greens, Grains & Bone Broth’s fresh ingredients are natural, contain no preservatives or artificial sweeteners and are locally sourced when possible. The Caveny family, successful entrepreneur and restaurateur Larry Wilson and medical industry veteran Todd Mansfield announced late last year that they would create a unique active lifestyle restaurant with plans to grow additional locations. Wilson owns more than twenty-five Moe’s and Hoopla! restaurants throughout Maryland, New York and Pennsylvania. He was recently named Moe’s Top Franchisee worldwide for his aggressive expansion and successful operation and growth of his stores.